For nearly 600 years, from the battles of the early fourteenth century to the dropping of the atomic bomb at Hiroshima, firearms derived from gunpowder and other chemicals defined the frightful extent of war. The apparatus and materials used in World War I would have been familiar to our remote ancestors. 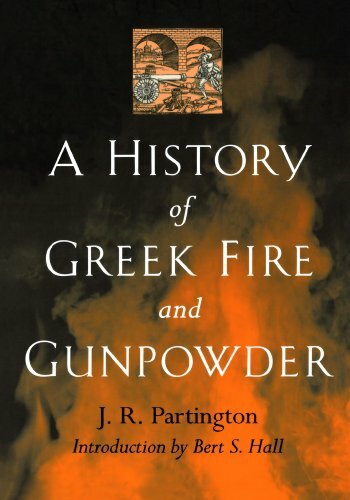 In this classic work, first published in 1960, James Riddick Partington provides a worldwide survey of the evolution of incendiary devices, Greek fire, and gunpowder. Greek fire, a composition Partington believes was made of a distilled petroleum fraction and other ingredients (but not saltpetre), was most famously used in the sieges of Constantinople and the Crusades. Partington moves from its antecedents―other incendiaries used in ancient warfare―to European gunpowder recipe books (The Latin Book of Fire, Bellifortis, and Feuerwerkbuch) and the history of infernal machines, mines, canon, small arms, and artillery. His book includes chapters on gunpowder and weapons in Muslim lands, India, and China―including fire books, the use of gunpowder as a propellant, the artillery of the Mughal Emperors, and the use of saltpetre in explosives. He traces the development of gunpowder to eleventh-century China and cites the first known mention and picture of a firearm in 1326.